The number one cost of most backyard chicken keeper is feed. In many places, household scale chicken owners might only just be able to produce eggs for the same cost of purchasing from a supermarket. Regular chicken feed is corn (maize) based in many parts of the world, often with barley or wheat mixed in – also known as ‘scratch’, this dry mix is usually a chickens least preferred meal. Laying pellets are commonly fed to hens, these are often comprised of corn, soy, barley and sometimes include ground oyster shells and other supplements. The ideal diet for a chicken is 1/3 bugs&worms, 1/3 grain&seeds & 1/3 greens. Greens can include grass (growing) and leafy plants. Unless you keep only a few chickens, or have extensive pastures & woodland areas for them to forage – you will need a strategy to feed them, since saving money is a big part of many peoples reason for keeping chickens. The most common way of keeping chickens is a single fenced area with a hen-house in the middle. Chickens will very quickly clear a suprisingly large area of vegetation if left to roam freely. All grass in the enclosure will be eaten within days, leaving a dry dusty surface. Less appetising plants may last longer, but with chickens constant scratching many plants in chicken enclosures will be pulled up by their roots. A popular method to manage chickens grazing is to use egg-mobiles (coops on wheels) to give chickens a new patch every day. This is a work intensive approach and requires flat, non rocky pastures and well built coops. The hens remain confined to a fairly small area and the only greens they are getting is grass – so this isn’t a great approach. Possibly the best strategy I have encountered is having a coop in the middle of 2,3 or 4 fenced areas. More space is needed, but with a few clever doors and walk-ways, it is possible to provide the chickens with fresh grazing each week (on a 4 week cycle), allowing grass and other plants to recover between feeding. If chickens must be confined to a single space, then it is necessary to provide them with green plants to keep them healthy. Popular greens with hens include spinach, carrot tops, kale, rocket, comfrey and pretty much any other salad plant that humans eat. Chickens like to eat a varied selection of grains & seeds. Oats are an excellent source of energy, especially in cold weather and are high in protein – making them a better choice than corn or rice based feeds. You can also add cracked barley and wheat to this. Seeds are very high in protein & energy which are both needed for laying hens. Add up to 25% of the amount of grain provided – chickens will eat just about any seed, but prefer the larger ones such as pumpkin and sunflower. Presoaking the grain overnight, or even fermenting for a few days before feeding can help make the nutrients more easily absorbed and the food more digestible. Sprouting the seeds and feeding as micro-greens is a fantastic way to provide greens as well as high protein seeds at the same time. Chickens favourite food is bugs, worms and snails. Beetle larvae in compost heaps are like caviar for the chicken world. 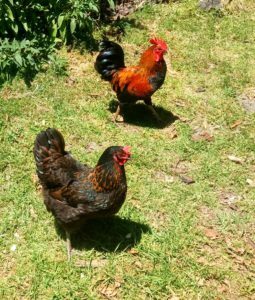 Combining compost making and chickens is a great way to provide bugs for the birds to eat, as well as getting chicken manure added to the compost. 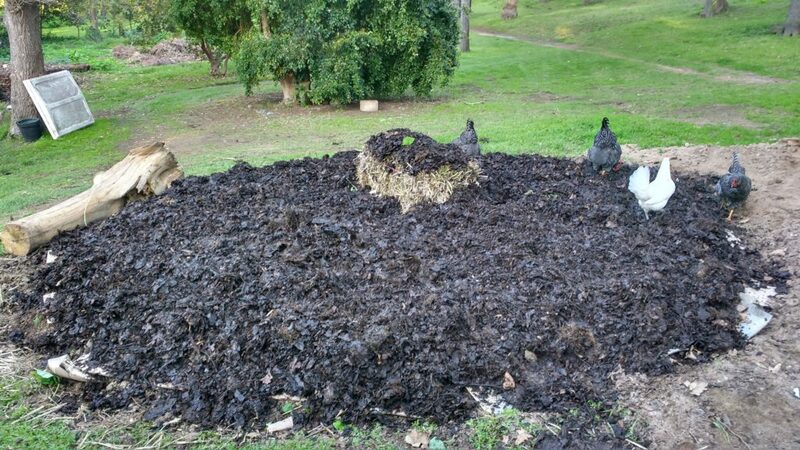 Build a big compost heap, then let the chickens break it down. Every so often turn the heap and let the chickens feast. After making new vegetable beds, let your chickens scratch over them for a few hours – the chickens will aerate the soil, add some extra nitrogen and eat any bugs in the soil. After the chickens have been removed then plant and mulch.